After a rough 26 hrs of travel we landed in Bali and was greeted by the sweet tropical air and a cocktail from the concierge. We spent four nights in Sanur on the southeast side of the island and then headed to Ubud for 3 nights. But the real highlight of the trip was our stay at LaJoya BiuBiu, Eco -Village Resort and Spa, in Balangan Beach. Words can not simply express how amazing this little slice of paradise is. LaJoya BiuBiu is a tropical vacationers dream. When we arrived we were greeted with a complementary cocktail and a 15 minute massage at the cliffside spa. 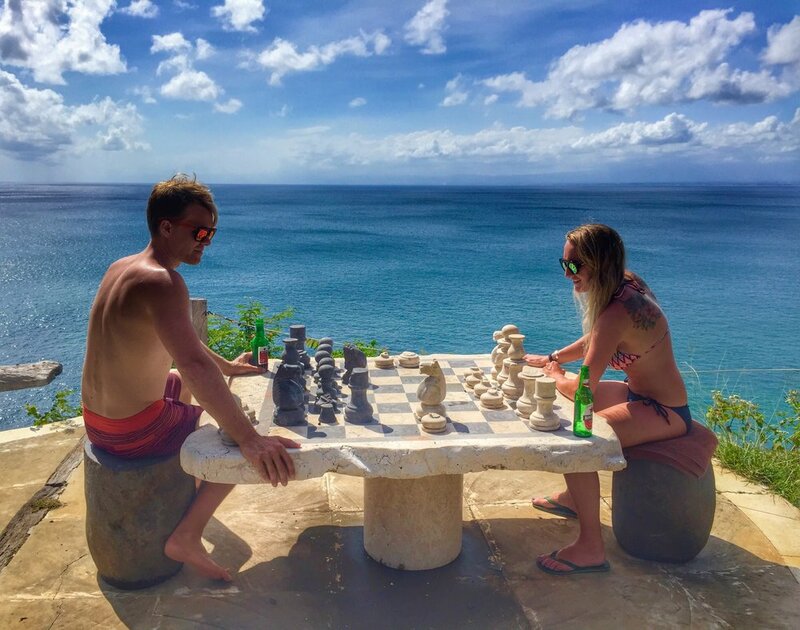 The staff is incredibly friendly and accommodating and hooked us up with a large, spacious native Balinese cabin with stone-wall shower, sunset deck and a tropical garden space. And air-conditioning, which was a major plus! The cliff side triple level infinity pool has the most peaceful views of the ocean that you won't find anywhere else in the area. The resort is just a short 7 minute walk to Balangan Beach and a 30 minute drive to Ngurah Rai International Airport. If you're not feeling the crowds at Balangan beach just head down LayJoya's private walkway to their own secluded beach below the seaside cliffs. The grounds at LaJoya are spectacular and one can easily spend their whole trip at the resort without venturing out at all, although I highly recommend exploring the area. The spa is easy to book a last minute appointment at as their priority is to in-house guests. There are several options for the spa like balinese, ayurveda, or deep tissue massage. The spa also has a picturesque hot outdoor shower and a cooling cliffside jacuzzi. Breakfast at LaJoya is included for all guest and their in house outdoor restaurant serves up delicious Indonesian and Western food. They also bake their own breads, croissants and pastries. I highly recommend their fruit smoothies! The restaurant also sits behind another gorgeous infinity pool on the property. Our stay at LaJoya BiuBiu is everything that we dreamed of for our honeymoon and more. We were both sad to leave and definitely hope to visit again some day. If you are lucky enough to visit Bali make sure to book some time at LaJoya, it will exceed all your expectations and I promise you will have a vacation that you will never forget! I'll take a fresh Piña Colada with this view please.